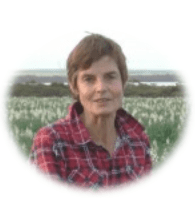 Hi there my name is Dot Cruickshank owner of this site. I have been involved with horticulture all my life. Both my parents were keen gardeners and have passed on their knowledge to me. I studied horticulture at school and furthered my study at Tertiary level gaining a Diploma in Horticulture. I have since been involved in many aspects of horticulture working in nurseries, for a local council dealing with among other things the propagation of seedlings for display gardens and planting and maintaining the gardens. At one stage I ran my own Rhododendron propagating business. I always grew vegetables for the family. After moving to a small property where space was at a premium I developed a keen interest in growing vegetables in containers so that I could still continue to produce as many tasty fresh vegetables as possible making the best use of my available space. In my next garden I was faced with a different issue…the soil was very poor and sandy and in a climate with very hot summers it was very difficult to grow vegetables in the conventional in ground method. Container growing was again my best option. I had never really given much thought about store bought vegetables because I had always grown my own. It wasn’t until we went and worked on a big cropping farm and saw what went on first hand that I realized that exactly the same was happening in vegetable production. Toxic pesticides and chemical fertilizers were liberally used and that was what people were eating if they didn’t grow their own. This was quite shocking to me especially as it is a well-known fact that these chemicals are harmful to our health. Now it is my mission to help as many people as possible to take care of their health by growing organically as many of their own vegetables as possible and avoid the pesticide residue on store bought vegetables. Using containers makes it possible for almost everyone. 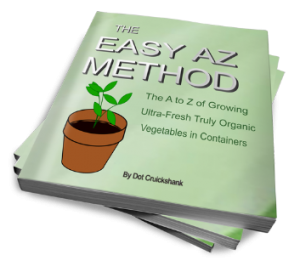 With this in mind I have written an eBook “The Easy AZ Method” The A to Z of Growing Ultra- Fresh Truly Organic Vegetables in Containers to help people get started and to realize that it isn’t hard to grow at least some of their own vegetables without even owning a garden.